I, also, would be interested to know if the KOT-V4 is two, two, two MBB's in one box! So, if there *ARE* 8 diodes, which diodes are actually switched?? Reading thru the KOT-V4 manual, looks like both "sections" can be made "overdrive". 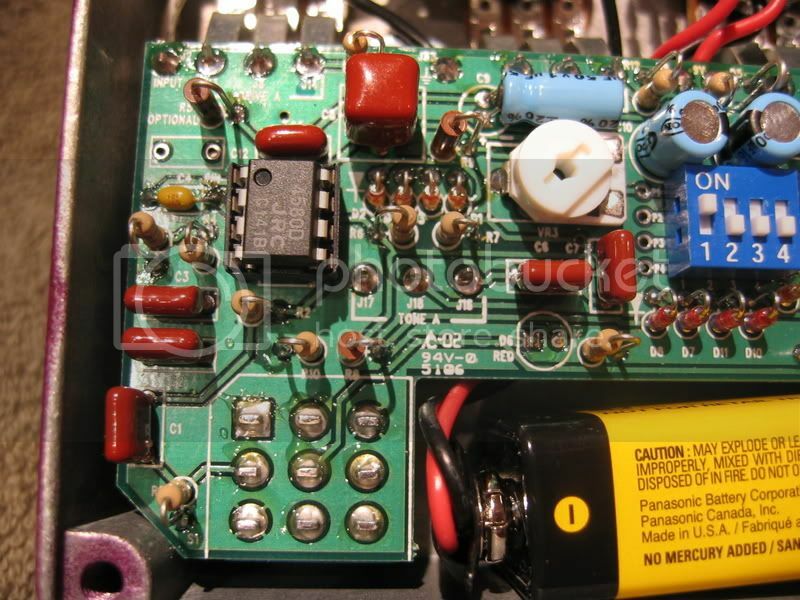 BTW, in the MBB, All of the diodes are in the feedback path. Carefull with that axe, Eugene!! when U take the KOT apart!! Thanx U all for all your efforts! I received these from a friend of mine in Poughkeepsie NY. Those pics are nice. See how he does that thing with most of the resistors and diodes standing up to save space? I do that all the time with my layouts, which is why it's nearly impossible for me to draw accurate layouts of my builds with the LayoutCreator program. 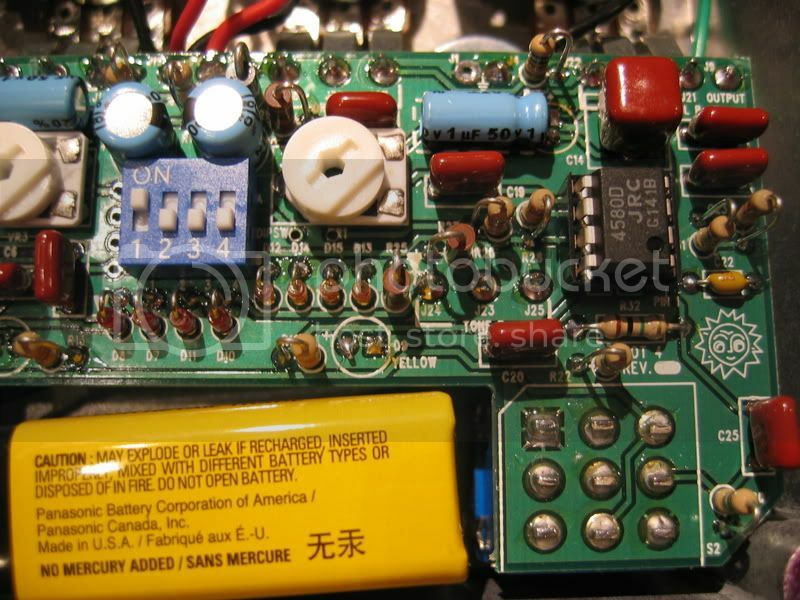 The first kit I ever built (a Radio Shack Volt/Ohm Meter kit) had the resistors mounted like that, so I've been used to it for a long time. It really saves a ton of space. soulsonic wrote: Those pics are nice. See how he does that thing with most of the resistors and diodes standing up to save space? I do that all the time with my layouts, which is why it's nearly impossible for me to draw accurate layouts of my builds with the LayoutCreator program. 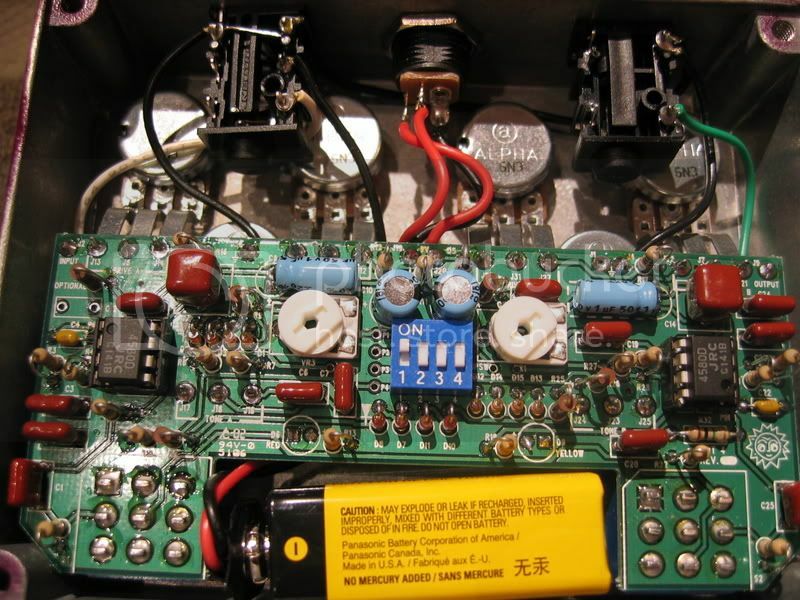 The first kit I ever built (a Radio Shack Volt/Ohm Meter kit) had the resistors mounted like that, so I've been used to it for a long time. It really saves a ton of space. I agree it saves space and looks cool but, it uses space less efficiently as well sometimes. It can be hard to run traces under standing resistors. It's kind of a catch 22 though and depends on the circuit whether there's an advantage or not. THANX! for those gut shots of the REV04, MarkM!!! Yep, both dual opamps on top..and many many diodes!!! Looks like 3groups of 4 = 12 diodes (probably 1N914 or equiv). Yes, parts on end... saves HORIZ space. IF it sounds good, play it TWICE LOL!!!! Thanx again for the new GUTS!!! markm wrote: I agree it saves space and looks cool but, it uses space less efficiently as well sometimes. I built a tonepad layout bluesbreaker a long time back. still have the pedal, to me its kind of weak. has low output, gain is nice but could use the ability to have more if you wanted. Its a tad unnatural sounding. Now I have played the KOT its nice, I guess I can hear the similarities but its almost as if the KOT addressed the issues I mention above. What can I mod in my bluesbreaker to improve the low output, give it more useable gain, and make it more TOOB, and lose that unnatural side to it. toneman, i read that site before its pretty cool. I am not sure how I can implement anything from their overdrive in my tonepad build. Thanks for posting the photos. My friend prefers I do not post the photos of his pedal's guts, but I can say your photos look very familiar. I see Japanese blue and yellow band diodes on the KOT 's gut shot. They sound way different compared to 1N4248 or 1N914, not as thin and whimpy. Furthermore a JRC 4580 sounds nothing like a 072.
anyone know the type number for these??? Bump for mystery mojo diode ID. glass diodes are usually just signal diodes (like the 1N914, 1N4148). power receifier diodes are usually "solid". schotkey diodes are like power diodes, but are faster switching and have lower V-drop. Germ diodes are most likely "signal" diodes, but won't have the freq response of a 914. Germ diodes have V-drop like the schotkeys. There ARE germ power diodes, but they are not usually in a glass envelope. The biggest difference I found was the symetrical vs asymetrical. These were in the feedback path, similar to the TubeScreamer(TS). single diodes or strings of diodes or strings of different diodes. So.........play around with different diode combos. a rotary switch selector seems the easiest way to compare one to the other. if it sounds good --- it's a keeper!!! if it sounds good --- play it loud!! So, the yellow-banded ones look like 1ss133 ('please in the clipping'), the red/blue band are difficult to see. Possibly the famous tubescreamer blue-band, 1s1588? In search of the Holy Moly Diode? the way i drew the schem it didnt look like a mbb - when i looked at certain parts upside down and twisted around a bit - it started to look very familiar - im giving stomp boxes a rest for a while - ill prob just lurk around for a few months but thought i should share this one before i do as i dont have any quarms sharing a clone of a commercial pedal - take care and make sure you share it with your friends over at diystomp! edit: should have just listened to JHS in the first place..
Last edited by theyear2042 on 28 Oct 2007, 04:14, edited 1 time in total. It´s astonishing how only (good) marketing can make the people really stupid. "Propaganda is the tool to influence the opinion of the individual in such a way that the single one even doesn´t recognize it....."
edit: sorry..... I forgot the very important carbon-comp resistors in the signal path who will create the mojo-sound..... maybe only for the true believer.